Balton Rwanda is an official Chromagen distributor. Chromagen is a pioneer in the production of solar water solutions since 1962. Solar water solutions bring innovation, quality and cost savings to home owners, institutions and commercial projects. Balton Rwanda is an official Chromagen distributor. Chromagen is a pioneer in the production of solar water solutions since 1962. Solar water solutions bring innovation, quality and cost savings to homeowners, institutions and commercial projects, such as hotels, hospitals, apartment buildings, and industrial plants. 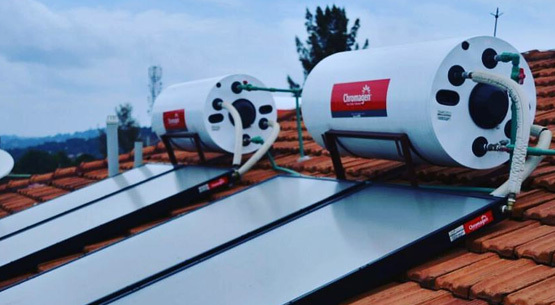 We take pride in our Energy Solution Department for providing complete solar water heating solutions that are individually handled by company engineers. This department analyzes project data, drafts preliminary design and ROI calculations, quotations, detailed engineering planning, installation, supervision, and after-sale technical support. The commitment to deliver top-of-the-line water-heating solar solutions is in conjunction with the belief to promote environmental awareness.